Stevie Nicks, in her first D.C.-area solo concert since the 2006 “Gold Dust Tour,” played Jiffy Lube (formerly Nissan) in a Live Nation-backed concert Saturday night that found the beguiling singer/songwriter lavishly showcasing her new album but also parsing her set list with plenty of hits to mostly keep everyone happy. Copies of the set list floating through the crowd before the show — as well as reviews from other stops on the current “In Your Dreams Tour” — were a tad misleading. While Nicks technically only sang 14 songs (six from the new record), it didn’t feel as skimpy as it looked on paper. With several anecdotes peppered throughout, two lengthy solos (one keyboard, another percussion) and a few lengthy outros that gave the band time to jam while Nicks changed clothes, it felt pretty robust, clocking in at nearly two hours. With Nicks’ impressive discography, both solo material and her decades of work in Fleetwood Mac, I’d hoped she’d slip in a few more songs but the evening admittedly had a nice flow. She never seemed rushed, never plowing through her set like she was crossing off a grocery list. 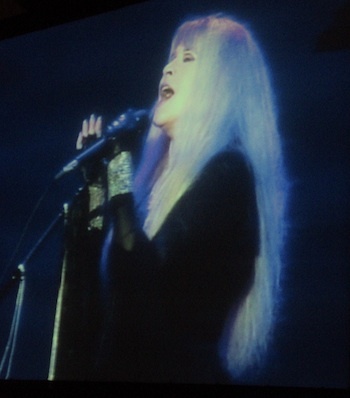 The evening’s most pleasant surprises were twofold: first, the proximity to Walter Reed nearly choked Nicks up as she introduced the jangly, sparse “Soldier’s Angel,” an ode to the troops that, despite its faithful live rendering, worked better live than it does on the album. Second, Nicks’ vocals were astoundingly sturdy. She didn’t wail and tear it up like she did in the old days, but there was a strength and shimmer to them I’d never heard before. She was aware of it too and credited vocal coach Steve Real, with whom she duetted on “Leather and Lace,” with the improvement. You never expect bell-like clarity from Nicks — the sandy patches in her timbre are a big part of her calling card — but she’s still finding largely untapped wells of reserve in her instrument in her fourth decade of performing. Pretty amazing. It was most noticeable on long, climactic notes on “Moonlight,” chestnut “Landslide” and show closer “Love Is.” The only disappointment is that she and cohort Dave Stewart didn’t capture more of it on the new album, where it’s only hinted at. The new cuts — she’d been out of the studio for nearly a decade — stood up surprisingly well to her classic cuts. She also seemed to genuinely enjoy herself. At times she defers too much to Mac-mate Lindsey Buckingham when they perform together and can come off nearly catatonic compared to his wild man stage antics, but Saturday night she helmed her tight, nine-piece band in a sizzling, exquisitely paced show.